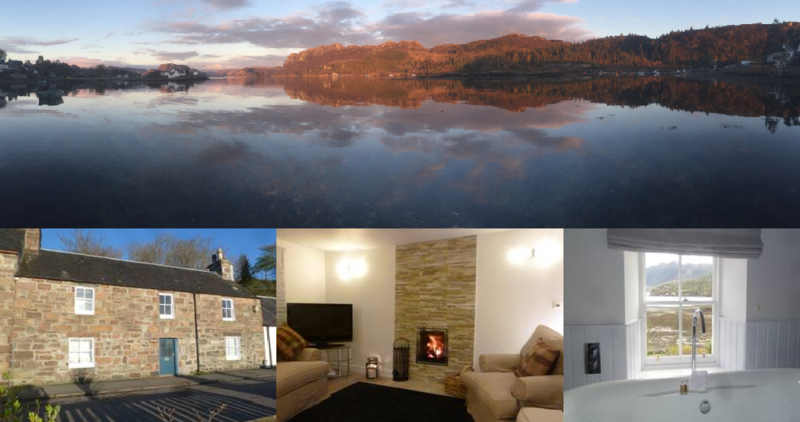 A truly luxurious self catering holiday home situated in the heart of the stunningly beautiful village of Plockton. A warm welcome awaits you in “Sannachan”, a traditional fisherman’s cottage thoughtfully updated to offer you self catering luxury that’s just a wee bit different, set right in the heart of the village. Known as “The Jewel of the Highlands” Plockton offers an abundance of things to enjoy, see and do. Whether you’re looking to explore the Highlands or just get away from it all; relax and recharge mind, body and soul. The house comfortably accommodates six guests in sheer luxury, all year round; small well behaved dogs are also welcome too, so your four legged friends can holiday with you in this beautiful Highland hide away! There are three bedrooms; one twin, one superking and you can configure the third as either twin or superking. Both upstairs bedrooms enjoy magnificent views overlooking Loch Carron towards Duncraig Castle and the panoramic mountain range beyond; with the added benefit of free standing baths, so you can soak away your cares whilst soaking in the amazing views! The downstairs twin bedroom also enjoys waterfront views and has its own en-suite shower room.